• Situate vehicle on a flat and solid surface. • For engines not equipped with engine slingers, attach proper slingers and bolts described in PARTS CATALOG. • If items or work required are not covered by the engine main body section, refer to the applicable sections. • Use either 2-pole lift type or separate type lift as best you can. If board-on type is used for unavoidable reasons, support at the rear axle jacking point with transmission jack or similar tool before starting work, in preparation for the backward shift of center of gravity. • For supporting points for lifting and jacking point at rear axle, refer to GI-37, "Board-On Lift". Remove engine and transaxle assembly from vehicle down ward. Separate engine and transaxle. • LH/RH front wheel. Refer to WT-7, "Exploded View". • LH/RH fender protector. Refer to EXT-22, "Exploded View". 2. Drain engine coolant. Refer to CO-62, "Draining". Perform when engine is cold. 3. Remove air cleaner case. Refer to EM-280, "Exploded View". 4. Remove turbocharger air inlet pipe. Refer to EM-280, "Exploded View". 5. Remove reservoir tank hoses. Refer to CO-66, "Exploded View". 6. Remove radiator upper hose. Refer to CO-66, "Exploded View". 7. Remove cooling fan shroud assembly. Refer to CO-68, "Exploded View". 9. Remove vacuum hose. Refer to EM-293, "Exploded View". 11. Disconnect engine room harness from the engine side and set it aside for easier work. 12. Disconnect transaxle side harness and clutch tube. 13. Disconnect shift cable and select cable. Refer to TM-78, "Exploded View". 14. Disconnect all the body-side vacuum hoses and air hoses at engine side. 15. Disconnect fuel feed and return hoses, and plug it to prevent fuel from draining. 16. Remove radiator lower hose. Refer to CO-66, "Exploded View". 17. Disconnect thermo plunger connector and earth cable. Refer to CO-72, "Exploded View". 18. Remove thermo plunger unit stay, and set thermo plunger unit aside for easier work. 19. Remove drive shaft lock pin and lock nut. Refer to FAX-77, "Exploded View". 20. Remove strut lower bolts. 21. Remove drive shaft assembly RH and LH. Refer to FAX-77, "Exploded View". 22. Remove A/C compressor with piping connected from engine. Temporarily secure it on body with a rope to avoid putting load on it. 24. Remove diesel particulate filter assembly. Refer to EX-17, "Exploded View". 25. Remove engine rear mounting bracket. 26. Use a manual lift table caddy (commercial service tool) or equivalently rigid tool such as a jack or trestle. Securely support bottom of engine and transaxle. Put a piece of wood or something similar as the supporting surface, secure a completely stable condition. 27. Remove RH and LH engine mounting bolts. 28. Remove engine and transaxle assembly from vehicle downward by carefully operating supporting tools. • During the operation, make sure that no part interferes with body side. • During the removal operation, always be careful to prevent vehicle from falling off the lift due to changes in the center of gravity. • If necessary, support vehicle by setting a jack or equivalent tool at the rear. During the operation, secure support the engine by placing a piece of wood under the engine oil pan, transaxle oil pan and suspended the engine slinger by baby crane (movable hoist) etc. 30. Separate engine and transaxle. 31. Lift with the hoist and separate the engine from the transaxle assembly. • Do not allow oil to get on mounting insulator. Be careful not to damage mounting insulator. 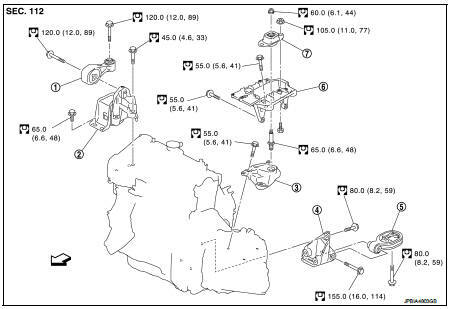 • When installation directions are specified, install parts according to the direction marks on them referring to components illustration. • Make sure that each mounting insulator is seated properly, and tighten mounting bolts and nuts. • Before starting engine check the levels of coolant, lubrications and working oils. If less than required quantity, fill to the specified level. • Before starting engine, bleed air from fuel piping. Refer to FL-50, "Air Bleeding". • Warm up engine thoroughly to make sure there is no leakage of coolant, lubricants, working oil, fuel and exhaust gas. • Bleed air from passages in pipes and tubes of applicable lines.